The historic 1860 Naval Cutlass Sword has been masterfully recreated in this modern day build! With form true to the original, this reproduction features a carbon steel blade, brass basket hilt / hand guard, leather and wire wrapped handle, and brass fittings. 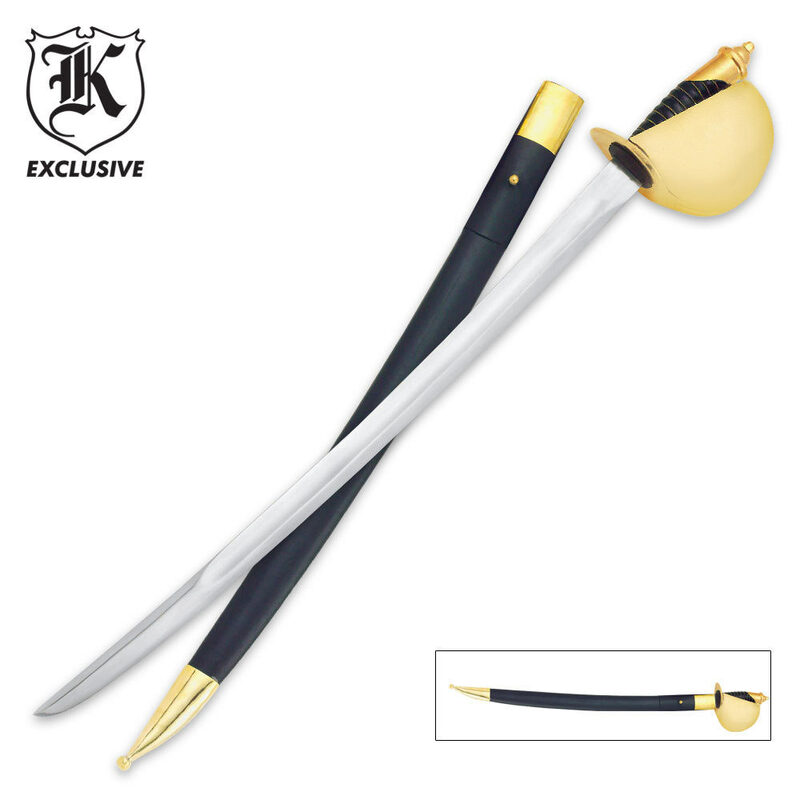 The matching scabbard is wrapped with leather and topped off with brass accents. Measurements: 25 1/2 in. blade, 31 1/2 in. overall. Got my 1860 U.S. Navy Cutlass Sword yesterday and I must say... IMPRESSIVE! For the price I wasn't expecting much but the brass guard is heavy beautiful where I expected stamped sheet brass (it looks like cast brass). For $50 you wont find a nicer sword! 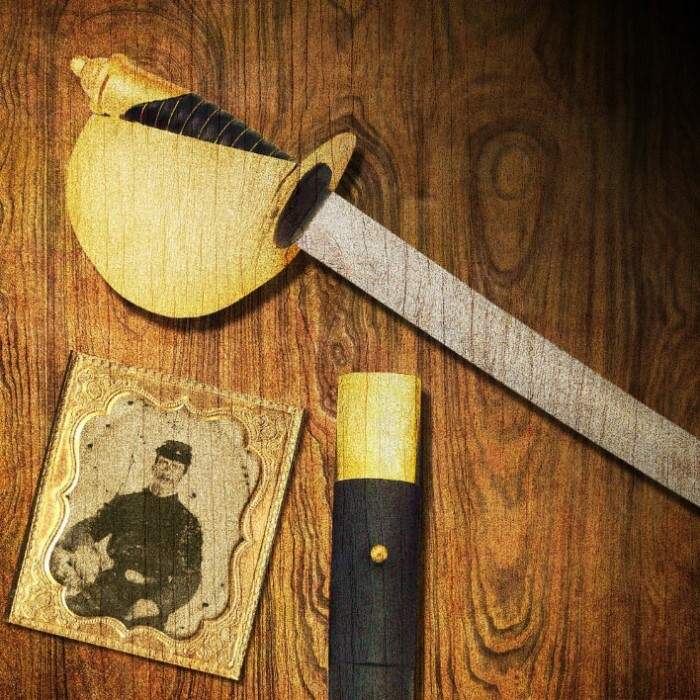 I have an actual 1862 Ames Naval Cutlass, which is the sword this replica appears to be patterned after. I wanted a cutlass for costume wear, as I wasn't about to use the antique, real sword for that. This cutlass arrived in good time, and in good condition. It is about a pound or so heavier, and it's blade is a bit thicker and not as curved as the real thing, but overall, it's not a bad replica for the price. This 1860 U.S. Navy Cutlass is by far the best replica of this sword I have ever seen. It is well built, and strongly made, the brass basket hilt was well plated, the plating will not wipe off when polished. This sword comes not only dull but without an edge, to sharpen this sword you must cut an edge first, if you never have cut an edge on anything I would take it to a professional. Once it's edged it will sharpen up nicely, and don't forget the Quarter edge. This Navy Cutlass is an excellent buy, all Navy Vets should have one. Thank you. Daniel of Nebraska. Very impressive look. I will proudly display this sword. Shorter than my other military swords, but I imagine that was a big plus in ship to ship combat. The sword has an impressive brass hand guard, and very heavy blade. This sword is far and away much nicer than I expected. If you are 'if'y' about this sword, don't be, certainly a bargain, and well worth the money. I just opened my birthday present...it was the 1860 Navy Cutlass ($49.99). This is a wonderful sword, good weight, sharp point and dull (as most melee weapons). The blade has a good amount of oil that I had to wipe off, no trouble. I am very pleased, nice quality and worth every penny. One of the curious things I have trouble with is that most young sword collectors seem to think that swords need to be sharp. Katanas are for slicing, most medieval swords are for smashing with a point to poke through chain mail. Swords weren't meant for blade to blade contact (rapiers and foils are, and they aren't sharp just pointed). the price is right for this well-made replica. Pleasure doing business with BUDK! Great for what it is, to hang on the wall or a convo piece for $50 bucks it shouldn't be in the same sentence as katana, unless you got a replica katana to! The sword came very dull. After hours of sharpening I finally got a decent edge only to realize that it's just way too heavy to be a combat ready sword. It's heavier than my katana, which is two handed. It's very hard to maneuver with only one hand and tires you quickly. The bolts from the hand guard stick out on the inside and can be irritating without a glove. Now that I made it sound like a piece of doo doo here's the good news. It's much cheaper than any battle ready swords I've come across. The gold hand guard and sheath is really nice and the guard offers more hand protection, which is another reason why it's so heavy. It has potential but don't go to starting trouble with someone who has a real battle ready sword, because you will die! Good Price, Dull, Stiff Blade, Durable, Hard to Sharpen, Heavy, and RIGHT HANDED ONLY, which was not in the description. Overall it's a good display sword. I used these swords for my military wedding. They look quite nice and the groomsmen definitely enjoyed them as a gift. I highly recommend this product.